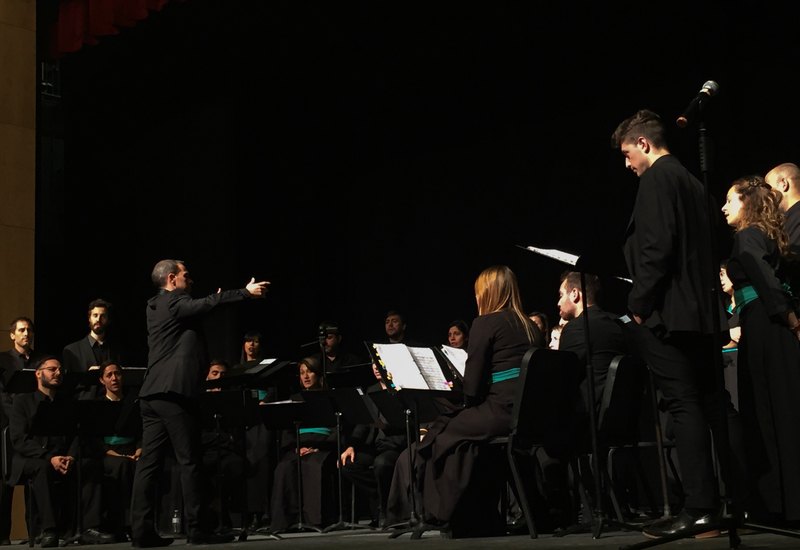 The Argentinian choir Vocal de Camara Platense performed during E-block Wednesday, March 28 in the auditorium. The choir, created in 1999 and conducted by Fernando Tomé, is made up of 29 singers from Argentina. The singers have performed at many prestigious concerts in venues from New York City to Hartford to Rome, where they sang for the Pope. The choir commenced their first song, “Arroz con Leche.” Only a few members started the song, but soon more and more voices were added, blending into each other. The song played with layers—deeper voices would drop out, then re-enter, then other voices would drop out, adding dynamism. This dynamism was furthered through changes in speed and volume. The song was lighthearted and cheerful as well, although it ended on a melancholy note. At the end of the song, Tomé and a member of the choir introduced the singers by section in Spanish and English. This tango was called “El Ultimo Café,” which means “the last coffee” in English. The tango was dramatic and compelling, and as Tomé said, melancholy. While it started slowly, it soon sped up and became more cheerful while still retaining a moody undertone. The piece was a highlight of the performance. To accompany the playful song, two members of the choir danced for the audience. The song was bouncy and cheerful, and soon Tomé and another choir member joined the dancing. The piece ended the performance on a light-hearted note, and when the song ended, audiences clapped loudly as the choir stood and bowed.